En mycket prisvärd splitter för att skicka HDMI-signaler till ett flertal displayer med samma signal. 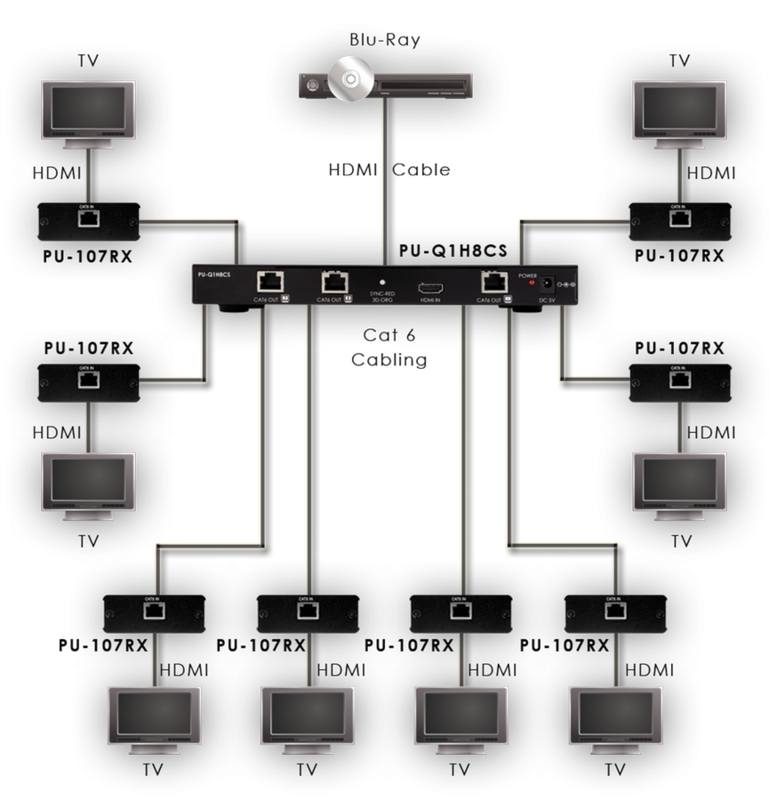 The PU-Q1H8CS has 1 HDMI input and 8 single CAT6 outputs to simultaneously distribute a HDMI source to eight displays. This solution is perfect for distributing the HDMI source content over longer distances than is usually achievable with HDMI cable, using cost effective CAT6 cable infrastructure. Use the PU-107RX Single CAT6 to HDMI Receivers on each of the eight CAT6 outputs to convert back from CAT6 to HDMI for connection to the display/s. v1.3 HDMI, HDCP 1.1 and DVI 1.0 compliant. 1 to 8 HDMI to single CAT6 splitter. Resolutions supported: PC - VGA to WUXGA: HDTV - 480i to 1080p plus 1080p24fps. High Definition Audio supported: Dolby TrueHD, Dolby Digital Plus and DTS-HD Master Audio plus LPCM. CAT output can run up to 40m @ 1080p, 8 bit. Selectable EDID settings - TV (downstream) or STD (fixed) and 12bit or 8bit Deep Colour. Supports ‘Deep Colour’ (10 & 12 bit).